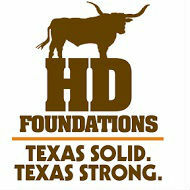 Home » SKILLED TRADES » General Contractors » HD Foundations, Inc.
We are the best foundation repair company serving Dallas, Texas. We provide commercial, apartment, and home foundation repair services. We offer affordable solutions, quality service, and a lifetime transferable warranty on all our repairs. It pays to call a foundation repair expert in Dallas. Better Business Bureau (BBB) rating of A+. Senior citizen discounts. Third party financing available.